Known as one of the most popular spots in Williamsburg, Egg lives up to the hype, despite the ridiculously long lines. Word of advice: arrive early. 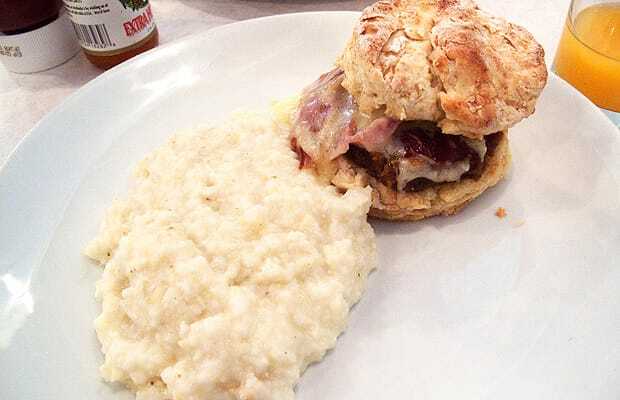 The country ham biscuit is my favorite. The warm fluffy buttery biscuit, laced with a layer of sweet fig jam and grafton cheddar, complements the salted country ham. A side of lumpy, richly textured grits accompany the dish. This visit, I also ordered the Grafton cheddar omelet with broiled tomatoes, hashbrowns, and a side of candied bacon. The three-egg omelet was scrambled to fluffy perfection, and the broiled tomatoes were soft but not slimy. Crisp but with a soft center, the hasbrowns were simply seasoned, just salt and pepper. Courtesy of the caramelized outer crust, the candied bacon was the real stand-out.